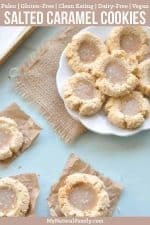 These Paleo coconut cookies have a simple cookie base with only 5 ingredients and are filled with a Paleo caramel sauce. They make a perfect Paleo Christmas cookie, but I really see no reason why they couldn’t be enjoyed year-round. So…I couldn’t help myself, I had to post one more cookie recipe for you. Why? Because you can’t have too many cookie recipes, especially during the month of December. Agree (of course you do)? Side note: Is anyone cookied out? I am not, but honestly, I am almost there, and I can’t believe I am saying it…but I think I am done with cookies for a while – at least a week. I am the biggest cookie lover out there, but I think I am going to need a sugar detox come December 26th (for at least a day). Luckily it is not December 26th, and this recipe is posted just in the nick of time for the last of the holiday parties. This recipe was inspired by my Salted Dark Chocolate Thumbprint Cookies recipe. 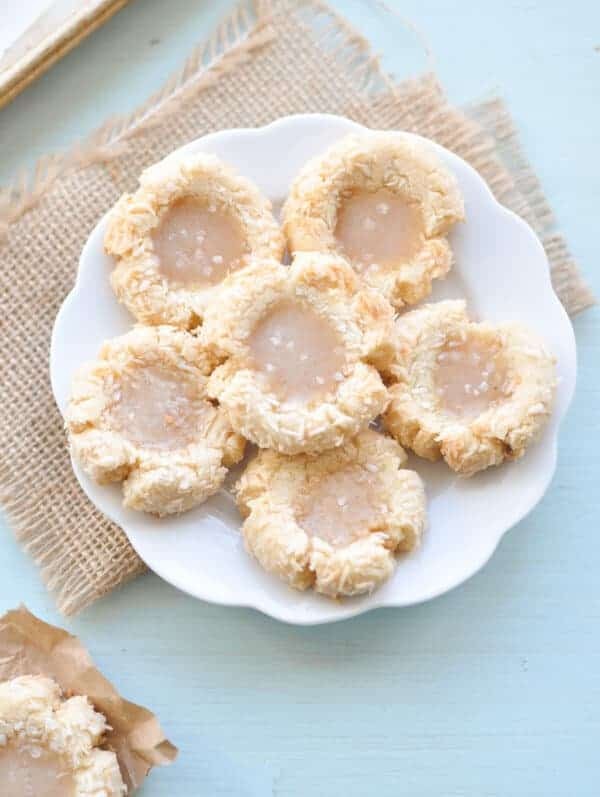 I wanted to make a non-chocolate cookie for my dad (he is seriously weird and doesn’t like chocolate), then I saw a caramel and coconut thumbprint cookie on MarthaStewart.com and so I got to work to create these heavenly salted caramel coconut thumbprint cookies – and yes – they are as good as they look, and as good as they sound. It actually made me a little bit grateful that my dad won’t eat chocolate, otherwise, I would have never come up with this recipe, and it is a good one!!! 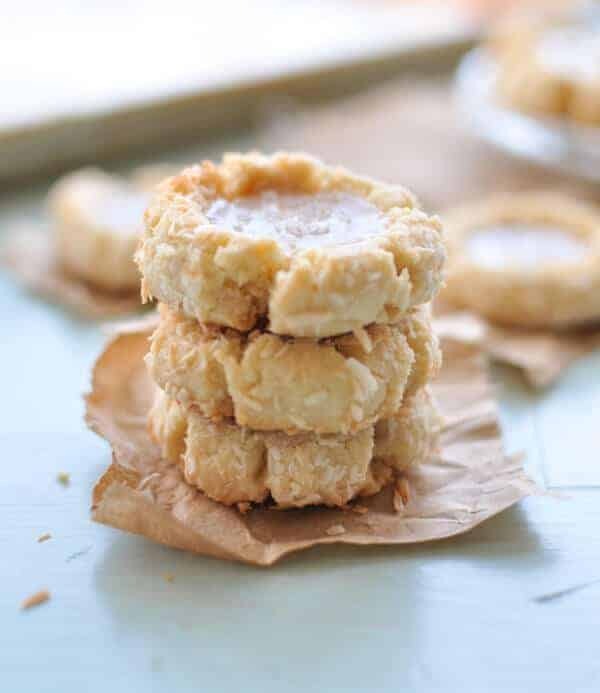 Plus these cookies are gluten-free, grain-free, Paleo and Vegan…my favorite type of cookie. Note: the caramel recipe here will work as well. Eating healthy, especially Paleo is hard to do day in and day out, but it is especially difficult during the holiday season. You aren’t fooling anyone when you say you haven’t considered eating the entire plate of peppermint brownies that your neighbor just dropped off. It’s alright, I have considered coming to your house to eat your entire plate of brownies :). Although it is difficult to stay on track, it is not impossible. I have 5 tips to help you stay on track during the holiday season. Hopefully, they will help you have fun, delicious, and healthy holiday festivities. Have a plan: If you are headed to a Christmas party where you know they are going to serve your very favorite mint chocolate fudge. Make a plan and stick to it; for example, decide ahead of time that you are going to make healthy choices at the party and enjoy 1 piece of fudge. Or better yet, bring a healthy treat you can feel good about eating. Avoid eating out: Eating at home is already minimized during the month of December, so avoid going out unless necessary (AKA you have a party to attend, not that you don’t feel like cooking :). If you know you are going to be especially busy and won’t have time to cook, plan ahead and prepare a large meal that creates a lot of leftovers, so you don’t have to worry about cooking for a few days. Fill up on veggies: If you are headed to a party, fill up on veggies either before or during the party. If you aren’t hungry, you are more likely not to over-indulge on sugary sweets. Eat a large salad or plate of veggies, and then enjoy a few of your favorite indulgences. Focus on consistency rather than perfection: Unfortunately, we aren’t perfect, and we will have slip-ups. Instead of beating yourself up for eating the entire plate of brownies, focus on being consistently healthy with your remaining meals. Consistency is the best way to get long lasting results, and not de-rail your healthy eating goals. Paleo Cookies Recipes – You’ll Love Them All! 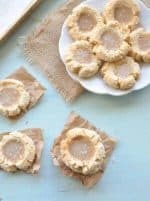 These Paleo coconut cookies only have 5 ingredients for the base and then are filled with a simple salted caramel sauce. This is a wonderful receipe! I’m so glad you like them. Thanks for commenting! just made these! they were super easy. i also wanted to mention I used maple syrup instead of agave and the syrup is great! Can you substitute honey instead of agave? I haven’t tried it myself, but I should think it should work fine. Please let me know if you try, so other readers will know how they turned out. I can’t seem to find the arrowroot powder :-(. Is there a substitute I can use? These look delicious! Love the salt on top. There is something irresistible about salted caramel or salted dark chocolate :)!